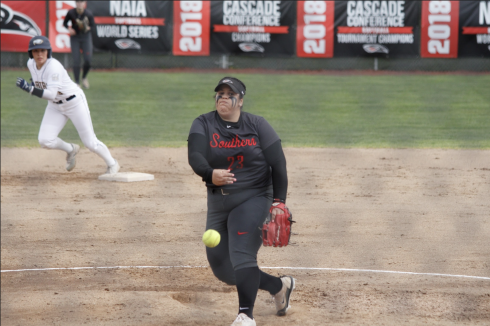 The Valentine’s Day matchup between Southern Oregon University and the visiting Oregon Institute of Technology was anything but lovely for the conference rivals on Saturday night. 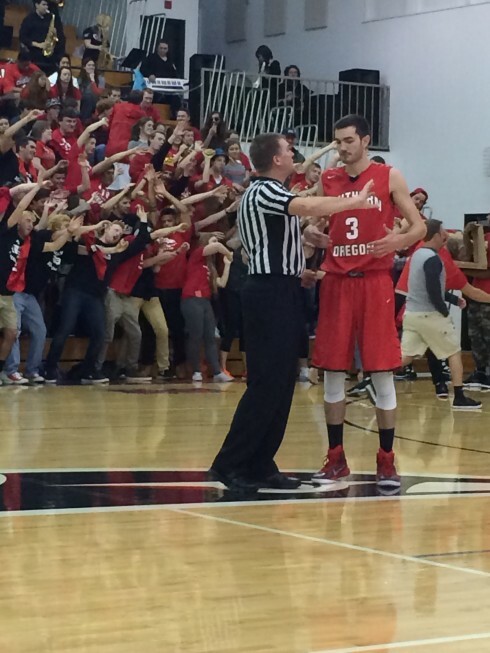 Tensions ran high as the packed crowd in Riehm Arena welcomed the 230th battle of the birds. The Red Raiders were fresh off a 98-59 win over New Hope in Eugene and continued their conference roll as they defeated long time rivals OIT. Their win didn’t come easily, though, as the Owls kept up full court press the entire game, which contributed to the outcome being decided late in the second half on the first ever Night of Champions. “We didn’t expect it tonight, but they saw the press work on us last week. It was how they were trying to pace the game,” Coach Brian McDermott said after the final buzzer. Another factor contributing to the game pace was that each team ran different types of zone defenses throughout both halves. Proficient ball movement became the deciding factor in order to get open looks for shots. 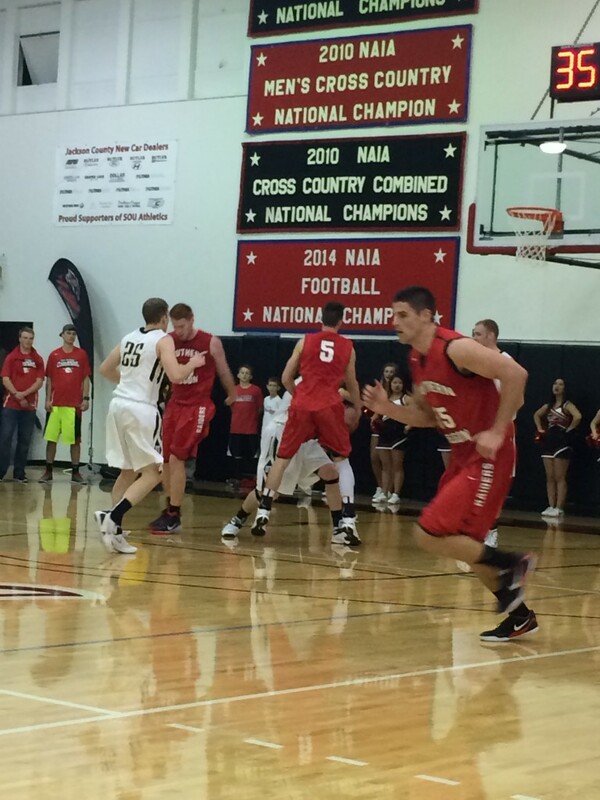 Out of the gate, SOU responded to the pressure with many shots beyond the arc. After senior Eric Thompson swished a corner field goal and deep three for the first points on the board, it appeared the Raiders were in for a night of hot hands. However, OIT’s hands heated up first, as Lavar Moore led them with 9 points to finish the first half in the lead 26-25. Webber discussing a call while student section hypes up. Instead of choreographed dance from the SOU cheerleaders, the gym floor was filled with Raiders from other sports during the halftime break. Women’s volleyball, men’s cross country, and the national champion football squads filled the court while their fall achievements were listed and praised by fellow athletes and community members. All three of the teams finished their seasons nationally ranked to establish SOU as one of the most powerful athletic programs in the NAIA. As the second half started, Southern Oregon took the floor with a new composure to not only make up the one point deficit but to take a lead they would hold for the rest of the game. “We took too many three’s at the beginning of the game but struck a nice balance in the second half,” McDermott said. Oregon Tech never seemed to find that balance, as the Owls shot only 19% on 31 three point attempts. Thompson, the most scoring player in Raider history, led the team with 18 points, while fellow senior, Tim Webber, shot perfectly from the field to add 15. Four of Webber’s points came from trips to the free throw line in the final minute as he connected all four attempts to put his team ahead 65-58. A steal with ten seconds left by Kenny Meyer was converted to a quick score by Thompson and finally put the Owls down 67-58, dropping them to 13-13 overall and 6-10 in-conference. 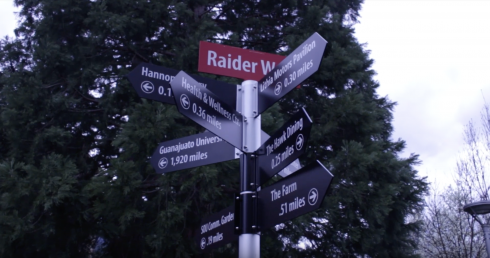 The Red Raiders look to continue their streak when they welcome #17 ranked Warner Pacific College to Ashland next Friday night in what’s sure to be another Cascade Conference battle.